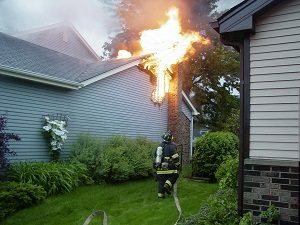 Surviving a residential fire can still be a traumatic event. Surviving a residential fire can still be a traumatic event. Making sure everyone gets out safely is your priority whenever such a fire happens. But even after everyone is safe, what happens next? Here is how to recover after a residential fire happens. Before anything else happens, you need to get in touch with your insurance provider. Besides your phone will already be constantly ringing as agents and investigators attempt to reach you. However, only discuss with your direct insurance agent about how to proceed with recovery after a residential fire. A vital part of your home insurance is to make sure it is protected against potential fires. Do whatever you can to prevent the risks of a fire, whether in the kitchen, the laundry room, or even the garage. Once the investigators from your insurance company arrive, you must do whatever you can to help them. Damage due to a fire is one of the biggest reasons investigators will move you to the front of the line when conducting their routine investigations. Meet with them whenever a meeting is scheduled, and promptly return their calls, messages, and emails. That way, all of the paperwork can be filed, and you can start receiving the benefits of your policy sooner. You might have a short list of valuables that you’d save in any residential fire. Even so, fires are unpredictable, and you might not be ready for it when one breaks out; so this means you’ll have to take stock of what’s left. Once you determine what can be saved, you’ll need to discard anything that is far too damaged by the fire to keep. Then, you’ll have to arrange storage solutions for whatever you do want to save after all. Finally, once you have somewhere to store your remaining belongings, you’ll need to start moving them to the storage location. Don’t leave your possessions in your car for too long, since this will ruin your gas mileage. Although paying rent for a storage unit is probably an ideal solution in this situation, at least you can communicate with your insurance provider and find other ideas for what to do. It’s also entirely possible that your insurance can give you a break and adjust your rates if you need to put things in storage. This entry was posted on Friday, April 6th, 2018 at 2:05 pm. Both comments and pings are currently closed.